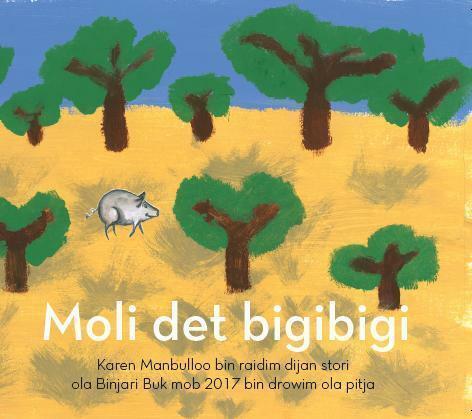 Written in Kriol and English, this is the story of Molly, a little pig who is rescued from the bush. She’s taken back to the community where she finds a happy home. Happy that is apart from the local dogs who keep chasing and frightening her. Moli is greatly loved in her community but what she loves most is Weet Bix. She loves it so much that it’s not too long before little Moli is a very big pig indeed. So big, she now chases and frightens the local dogs. All in good fun, of course. The illustrations are an absolute delight and watching Molly grow and grow and grow will bring a smile to readers' faces and outright laughter at the end.